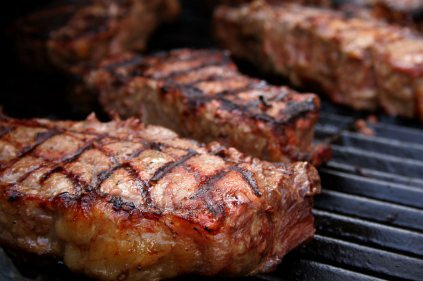 Supple, moist and tender, the Meaty Meats Steak is only as good as the livestock from which it is cut. Only well treated, all-natural Beef is fit to be called a Meaty Meats Steak. It takes years to foster solid, lifelong relationships with local farmers. Only Trust and integrity are paramount when producing food for your loved ones. At Meaty Meats, we’ve taken the time to make sure that our steaks meet only the highest standards – yours. What you think is most important to us, and we strive to exceed this goal in all that we do. This is why we only use all-natural beef. Antibiotics or growth hormones are never used. The livestock is always fed premium grain or grasses and it never comes into contact with feed that contains animal by-products. This is why our steak’s quality speaks for itself – only the natural flavor and goodness shines through without being masked by preservatives, artificial colors or flavors. You can feel confident knowing you are serving only the best to those you care about. All of the Meaty Meats products are processed in our state-of-the-art federally accredited facility. Our beef is hand cut by dedicated artisans that live for their craft, not on a production line were attention to detail can be lost. Try our succulent steak tonight. You will be thrilled with the results! Try it in a classic family recipe or use one of our recipes found our recipes section.